Hello, I’m Liu Lianzhe, a senior Chinese student of JAMK. I just completed my practical training in Rongji Financial Services Company in Wuhan, China, where is my lovely hometown. Although I was born in Wuhan, I first practiced in my hometown. For all the newcomers, the first day in company is especially important. My mom and dad emphasized several times that I must arrive at company in advance and never be late. So the first day before work, I went to bed at 9 o’clock, and the next day I was so nervous and excited that I didn’t sleep well all night. 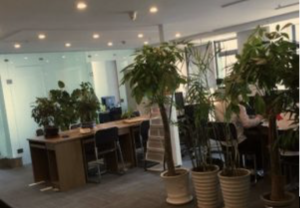 The first impression I got from the company was that it was not very big, but it was quiet and tidy. My supervisor took me familiar with the environment and introduced the daily task briefly. At the beginning of my internship, I didn’t think it was a very difficult job, but when I really became an investment and financial specialist, I realized that I still lack of practical capabilities. Also,I found many problems, our department often have meetings to hand in financial products sales list, so I need to complete all the company’s tasks before deadline. In my work, I should remember the names of each company customer and their needs in order to follow up the status of their financial products at any time. The pressure of a lot of tasks make me nervous. But I think this is also one. But I think this is also a good start, the first step into the workplace: to adapt to the workplace environment and work pace. During the internship, I got some thinking towards my career in my mind.The income level of Chinese employees in recent years has been rising sharply. But job satisfaction in China’s workplace, especially among our young employees , does not seem to have risen rapidly in recent years as the same as wages. Basically, most of us are not only dissatisfied with the salary but also unable to obtain the sense of achievement from current job. As far as I am concerned, I think the greatest significance of my present internship is to gain valuable experience rather than payment. It is possible that my job hopping in the future will be changed, such as working in other countries or even being a painter. China’s economic development has slowed down in recent years, and the high pressure of social competition among our new comers is common phenomena, but we still believe that we’ll have bright future. I also hope that I will strengthen my faith in the workplace and continue to work hard.